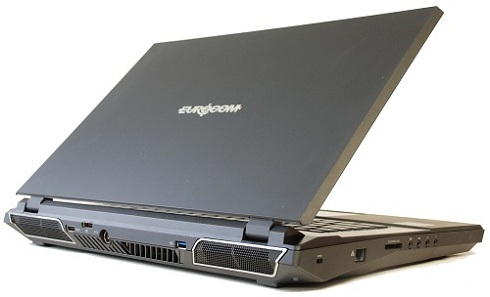 Eurocom Corporation (www.eurocom.com), a leading developer of high performance Mobile Workstations and Fully Customizable Notebooks is shipping a complete line of 3D capable Workstations for professional use on the go. Eurocom envisions a future where engineers can design complex mechanisms as if they were right in front of them. Eurocom sees a world where doctors can examine MRI results in three dimensions and prescribe accurate treatments faster. To make this future a reality, Eurocom has launched a powerful new product line of 3D enabled Workstation platforms. Powering the three dimensional displays of the Eurocom 3D Workstations are an optional NVIDIA GeForce GTX 680M in single or dual operation or NVIDIA Quadro K5000M graphics. Professional 3D capability is offered by combining 3D Vision glasses, a built in emitter, a 120hz panel and 3D capable software. “Displayed 3D data is useful for a wide variety of applications and can offer a wide range of advantages and can fit seamlessly into a full 3D design engineering process. Eurocom Mobile Workstation technology is currently being used to design, simulate, then 3D model the prototype before a 3D printed prototype is created, greatly expediting the design process” Mark Bialic, Eurocom President. The EUROCOM Panther 5D and Scorpius 3D support Quad Buffering 3D technology, via supported NVIDIA Quadro and GeForce cards to enhance their capability and professional deployment. Supporting 3D technology provides users with an immersive 3D experience in games, movies, and any content with built in depth. Eurocom Mobile 3D workstations fit seamlessly into a 3D ecosystem complete with 3D scanners, 3D printers and 3D software applications. NVIDIA 3D Vision, NVIDIA graphics combined with Eurocom 3D Mobile Workstations solutions deliver the highest quality and most advanced 3D environments, enabling designers, engineers, digital artists, animators, digital sculptors, and scientists to view and share their work in beautiful 3D. Eurocom 3D on the go Workstations provide opportunities for professionals to operate Virtual Labs on the Go, 3D Scanning on the Go and Engineering and Design on the Go. Having 3D capability with the professional grade hardware offered by Eurocom’s line of 3D Workstations allows for design of new products anywhere in the world while offering engineering capacity onsite, anywhere, being able to reduce time to market, downtime and development costs of projects. EUROCOM Panther 5D delivers unmatched 3D capabilities for heavy duty 3D and 2D applications, like CAD (Computer-Aided Design), CAE (Computer-Aided Engineering), DCC (Digital Content Creation), visualization, and simulation. It is ideal for Engineering on the Go and for Rapid Engineering Deployment Teams. Driving the system is a complete line of 6 core and 8 core Intel Xeon and Intel Core i7 Processors based on the LGA 2011 processor socket. EUROCOM Panther 5D supports two VGA modules via standard MXM 3.0b interface with the ability to support up to two 100W per cards running in SLI. EUROCOM Panther 5D uses quad channel memory, and enables the Panther 4.0 to initially support up to 32GB of DDR3 1600MHz RAM via four 8GB SODIMM 204 pin modules. The Panther 5D has support for four Solid State or Enterprise level drives with RAID 0,1,5,10 capability. The Scorpius 3D was designed as a high performance notebook computer platform with long lifespan and full upgradeability. The EUROCOM Scorpius 3D is a full size notebook that supports 4 RAM slots up to 32GB, up to three internal 1TB physical drives with RAID 0/1/5, mSATA SSD, up to two 100W VGA cards running in or SLI configuration. Driving the system are Intel’s newest 22nm Ivy Bridge processor up to Intel Core i7-3940XM Processor Extreme edition. The Scorpius is equipped with dual MXM 3.0B slots rated for 100W GPUs and is ready to SLI the fastest 28nm NVIDIA GPUs. For heavy duty rendering where the utmost accuracy is required, the Quadro K5000M’s ECC (error correcting code) memory is up to the task. NVIDIA Quadro cards offer OpenGL quad buffered stereo support, for a smooth experience working with complex 3D models. •	NVIDIA 3D Vision 2 complete with 3D vision 2 glasses, built in emitter, 120 hz Full HD 1920x1080 matte display. •	MXM 3.0b graphics interface with support for two graphics cards. 4 GB DDR5 NVIDIA GeForce GTX 680M and 4 GB DDR5 NVIDIA Quadro K5000M supported. •	Intel X79 Chipset, socket LGA 2011. Supports up to Intel Core i7-3970X Processor Extreme Edition and Intel Xeon E5-2687W. •	MXM 3.0b graphics interface with support for two graphics cards. NVIDIA GeForce GTX 680M and NVIDIA Quadro k5000M supported.